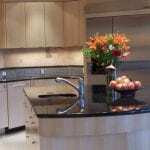 A bamboo kitchen floor is among the trendiest kitchen flooring materials. An environmentally friendly option, bamboo flooring is comparable to hardwood flooring, but without the high cost associated with it. In terms of looks, bamboo is beautiful. Bamboo is a grass that grows very quickly. When it matures, the stalks are milled into strips. These strips are then used as floorboards. Also in addition to strips you can also go for plank bamboo flooring. You can get both unfinished and pre-finished boards. The unfinished bamboo kitchen flooring comes with squarish edges. Roughly 3/8 or 5/8 inches thick the boards are arranged to look like a hardwood floor. You can get pre-finished bamboo in two colours – natural bamboo flooring and carbonized flooring. There is also a choice of glossy or matte finish. 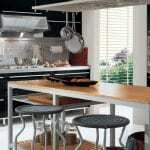 The carbonized bamboo is like natural cherry color and gives the kitchen a cosy warm aura. Carbonization involves steaming the bamboo at high temperatures where it undergoes a change in colour. 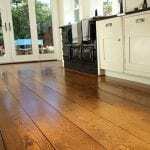 Bamboo can also be stained to achieve darker colours. The grain can be set to go horizontally or vertically. 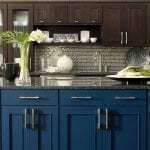 With the horizontal grain you usually find wide strips that look more like natural bamboo while the vertical is in narrow strips. It is advisable to have a layer of padding under any furniture on this type of flooring since it can scratch easily. 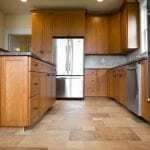 Even though bamboo is fairly water resistant, around the sink or stove area, it is better to place area rugs to ensure that any spills or puddles of water are contained. Bamboo kitchen floors are easy to clean since you only have to sweep and mop it. At the time of installing, it is best to get it professionally done to avoid possibilities of moisture getting locked in. As mentioned earlier the best thing about bamboo is that it is environmentally friendly. It is available pre-finished. It is a durable as well as looks great. Bamboo is stronger than most woods and lasts for decades. It has high fire resistance. Probably the only shortcoming is that there is not much choice in colour since you must confine yourself to the natural to dark shades. However, recently a lot of bamboo manufacturers are offering a much wider choice.